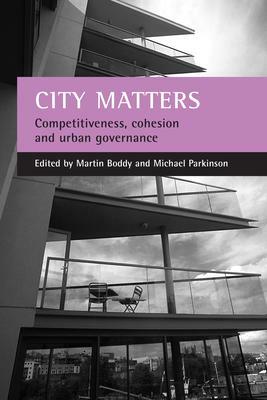 This book provides, in a single volume, a review of the findings of the largest ever programme of cities research in the UK, the Economic and Social Research Council's 'Cities: Competitiveness and Cohesion programme'. Leading experts present the findings of this wide-ranging programme organised around themes of competitiveness, social cohesion and the role of policy and governance. The book develops our understanding of key processes, issues and concepts critical to cities and urban change and examines a large body of evidence on a wide range of policy issues at the heart of current debates about the performance of cities and the prospects for urban renaissance. City matters is essential reading for all policy makers, practitioners, analysts and academics with an interest or involvement in urban issues. Introduction Michael Parkinson and Martin Boddy; Part One: Competitiveness, cohesion and urban governance: Sources of city prosperity and cohesion: the case of Glasgow and Edinburgh Ivan Turok, Nick Bailey, Rowland Atkinson, Glen Bramley, Iain Docherty, Ken Gibb, Robina Goodlad, Annette Hastings, Keith Kintrea, Karryn Kirk, Joe Leibovitz, Bill Lever, Jimmy Morgan and Ronan Paddison; Reinventing cities in a restructuring region? The rhetoric and reality of renaissance in Liverpool and Manchester Alan Harding, Iain Deas, Richard Evans and Stuart Wilks-Heeg; Competitiveness and cohesion in a prosperous city-region: the case of Bristol Martin Boddy, Keith Bassett, Shaun French, Ron Griffiths, Christine Lambert, Andrew Leyshon, Ian Smith, Murray Stewart and Nigel Thrift; London: competitiveness, cohesion and the policy environment Ian Gordon, Belinda Brown, Nick Buck, Peter Hall, Michael Harloe, Mark Kleinman, Karen O'Reilly, Gareth Potts, Laura Smethurst and Jo Sparkes; Part Two: Competitiveness and urban change: Urban growth and competitiveness in Britain: a long-run perspective Barry Moore and Iain Begg; Migration, residential preferences and the changing environment of cities Tony Champion and Tania Fisher; Cities are not isolated states Paul Cheshire, Stefano Magrini, Francesca Medda and Vassilis Monastirotis; Part Three: Competitiveness, innovation and the knowledge economy: Competitiveness as cohesion: social capital and the knowledge economy Philip Cooke; Innovation clusters and competitive cities in the UK and Europe James Simmie; Part Four: Housing, property and economic performance: The role of housing in city economic performance Geoffrey Meen and Mark Andrew; Economic structures, urban responses: framing and negotiating urban property development Simon Guy and John Henneberry; Part Five: Space, place and social cohesion: Does spatial concentration of disadvantage contribute to social exclusion? Nick Buck and Ian Gordon; The 'good' suburb as an urban asset in enhancing a city's competitiveness Peter Halfpenny, Nadia Joanne Britton, Fiona Devine and Rosemary Mellor; The middle class and the future of London Tim Butler; Part Six: Ethnicity, enterprise and social cohesion: Whose hidden assets? Inner-city potential for social cohesion and economic competitiveness Jo Foord and Norman Ginsburg; Ethnic enterprise in an inner-city context: the case of the independent restaurant sector in Birmingham Trevor Jones, Tahir Abbas and Monder Ram; Youth employment, racialised gendering and school-work transitions Sophie Bowlby, Sally Lloyd Evans and Clare Roche; Part Seven: Leadership, governance and social capital: Leadership and partnership in urban governance: evidence from London, Bristol and Glasgow David Sweeting, Robin Hambleton, Chris Huxham, Murray Stewart and Siv Vangen; 'Pathways to integration': tackling social exclusion on Merseyside Richard Meegan; Voluntary organisations and the generation of social capital in city politics Gerry Stoker, Graham Smith, William Maloney and Stephen Young; Conclusions: Competitiveness, cohesion and urban governance Martin Boddy and Michael Parkinson. Martin Boddy is Professor of Urban and Regional Studies and Associate Dean in the Faculty of the Built Environment at the University of the West of England, Bristol. Michael Parkinson is Director of the European Institute for Urban Affairs, Liverpool John Moores University.